TUCSON, Ariz. - Pima County issued a health warning Tuesday based on high ozone conditions. Ozone can cause serious health problems but there are things you can do to reduce the trouble. A hazy sky does not equal ozone but ozone equals trouble especially if you have breathing trouble already. When ozone is high some people may be wheezing coughing and short of breath. Their throat may be irritated too. The trouble could become bad enough to call for a trip to the doctor. 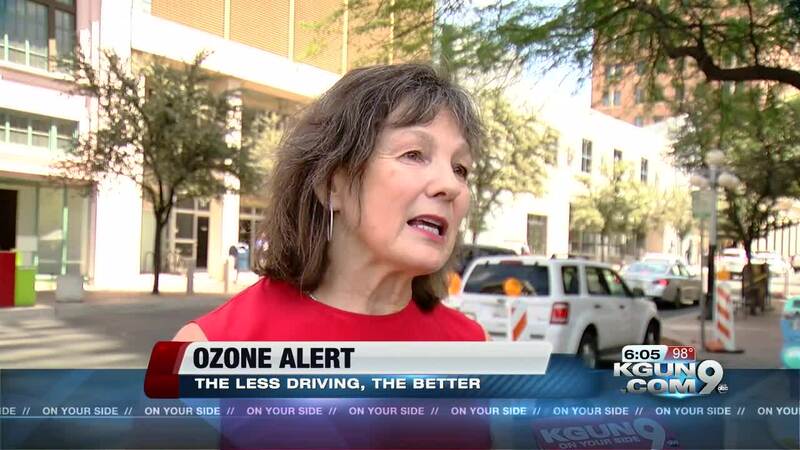 Pima County Environmental Quality Director Ursula Nelson says, “Really the important thing is, especially for people who are sensitive to elevated levels of ozone is just to not be outside as much to limit any exercise outside and just take care of protect yourself." You may be riding around in what's causing the ozone. Vehicle exhaust is the main culprit so the less you run your car the better. That includes avoiding a lot of time idling at spots like the drive-through. Just gassing up can release vapors that add to the ozone. It's better to fuel up after six pm when conditions make ozone less likely to form. An air gauge can help you reduce air pollution by checking your tires regularly and making sure they're at the right pressure. If they're at the right pressure you have less rolling resistance. Less rolling resistance means better gas mileage. Better gas mileage means less pollution. And riding the bus can help cut pollution because moving a busload of people creates less pollution per person than if they were all running individual cars.